“Data scientist” is a broad term that can refer to a number of types of careers. Generally, a data scientist analyzes data to learn about scientific processes. 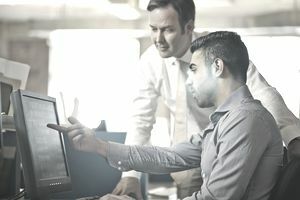 Some job titles in data science include data analyst, data engineer, computer and information research scientist, operations research analyst, and computer systems analyst. Data scientists work in a variety of industries, ranging from tech to medicine to government agencies. The qualifications for a job in data science vary because the title is so broad. However, there are certain skills employers look for in almost every data scientist. Data scientists need strong statistical, analytical, and reporting skills. Here's a list of data scientist skills for resumes, cover letters, job applications, and interviews. Included is a detailed list of the five most important data scientist skillsets, accompanied by lists of related skills and work responsibilities. A key part of creating a resume and cover letter that gets noticed by employers is to incorporate as many job-specific keywords and keyword phrases as possible. This is because employing companies now frequently use automated applicant tracking systems (ATS systems) to provide first-stage analysis of the job applications they receive. The more keywords your resume contains, the more likely it is to pass the first cut by the ATS system and, ultimately, reach the human eye of a hiring manager. The terms listed here are among the most frequently-sought keywords programmed into ATS systems and utilized in job advertisements for data scientists. Thus, you should try to incorporate many of these keyword phrases into your resume – in an initial summary of qualifications, in your work history section, and in a tech table describing your hardware and software skills. You should also describe your command of the most important of these skills in your cover letter and, eventually, during your personal interviews. Be sure to enhance these descriptions with specific examples of how you have utilized each skill in a work or training setting. Your best guide as to which of these keywords you should include is the job description to which you are applying. Each job you apply to will require different skills and experiences, so make sure you read the job description carefully and focus on the skills listed by the employer, tailoring each resume and cover letter you submit to the qualifications requested by different employers. Perhaps the most important skill for a data scientist is to be able to analyze information. Data scientists have to look at, and make sense of, large swaths of data. They have to be able to see patterns and trends in the data and explain those patterns. All of this takes strong analytical skills. Being a good data scientist also means being creative. Firstly, you have to use creativity to spot trends in data. Secondly, you need to make connections between data that might seem unrelated. This takes a lot of creative thinking. Finally, you need to explain this data in ways that are clear to the executives at your company. This often requires creative analogies and explanations. Data scientists not only have to analyze data, but they also have to explain that data to others. They must be able to communicate data to people, explain the importance of patterns in the data, and suggest solutions. This involves explaining complex technical issues in a way that is easy to understand. Often, communicating data requires visual, oral, and written communication skills. While soft skills like analysis, creativity, and communication are important, hard skills are also critical to the job. A data scientist needs math skills, particularly in multivariable calculus and linear algebra. Data scientists require basic computer skills, but programming skills are particularly important. Being able to code is critical to almost any data scientist position. Knowledge of programming languages such as Java, R, Python, or SQL is essential. According to the Bureau of Labor Statistics, 27,900 people were employed as computer and information research scientists in 2016; their median annual wage in 2017 was $114,520. Career opportunities in this field are anticipated to grow 19 percent by 2026, much faster than average.